Avram Davidson was an American Jewish writer of fantasy fiction, science fiction, and crime fiction, as well as the author of many stories that do not fit into a genre niche. He won a Hugo Award and three World Fantasy Awards in the science fiction and fantasy genre, a World Fantasy Life Achievement award, and a Queen’s Award and an Edgar Award in the mystery genre. Davidson edited The Magazine of Fantasy and Science Fiction from 1962 to 1964. His last novel The Boss in the Wall: A Treatise on the House Devil was completed by Grania Davis and was a Nebula Award finalist in 1998. Here is a website devoted to Mr. Davidson. Vergil Magus — (1966,1986) Publisher: Against the backdrop of a hauntingly familiar yet alien otherworld, Avram Davidson casts the adventures of the sorcerer known as Vergil Magus. Vergil was to construct a virgin speculum, a mirror of magical properties. The Phoenix and the Mirror, written by Avram Davidson and published in 1966, is based on the medieval legend that the poet Vergil (The Aeneid) was a mage and sorcerer. Queen Cornelia of Carsus has taken hostage part of Vergil’s soul. This leaves him feeling like less than a full man — he’s unmotivated and impotent. 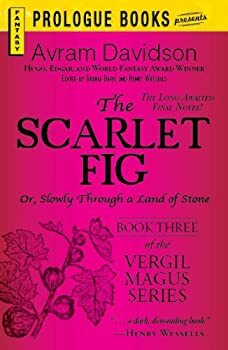 Though some of his parts don’t work too well, Vergil’s brain still works fine, so he sets out to meet Cornelia’s demand: manufacture a virgin speculum so Cornelia can scry the whereabouts of her kidnapped daughter, Laura. 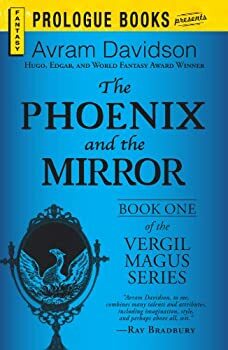 I loved The Phoenix and the Mirror, the first book in Avram Davidson’s trilogy about the mage Vergil in ancient Rome, but the two sequels are disappointing. 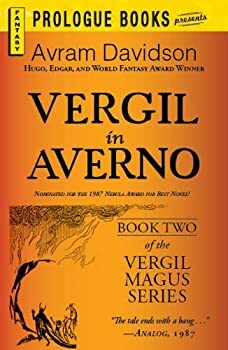 The first sequel, Vergil in Averno, is a travelogue of Vergil’s visit to Averno, a place that ancient Romans thought might be the gate to Hell. (It’s not nearly as interesting as that might suggest, though.) It had little plot, but at least it displayed Avram Davidson’s amusing sense of humor. Kar-Chee — (1966) This omnibus contains the two original novels: The Kar-Chee Reign and Rogue Dragon. Other reprint editions are available. Rogue Dragon: Jon-Joras came to Earth to oversee arrangements for a dragon hunt to amuse his king. The dragons, brought to Earth centuries earlier as pets of an alien race, were powerful but slow-witted — until now! Now, Jon-Joras finds himself caught in the middle of an uprising that could shake the powers of the galaxy! Doctor Eszterhazy — (1969-1975) Amazon: This invaluable collection of Avram Davidson’s resonant, witty short stories describes some incidents in the career of many-times-Doctor Engelbert Eszterhazy, loyal subject of the Triune Monarchy of Scythia- Pannonia-Transbalkania, located in a nineteenth-century Europe whose political landscape will be, after a little reflection, familiar to most fantasy readers. Enquire with Doctor Eszterhazy into curious matters — the lurley; the old woman who lived with a bear; gingerbread men; dancing goats; and more. NB: Read the stories in the order written, beginning with “Polly Charms”, and turning back to read the later stories at the front. Peregrine — (1971,1981) Publisher: Peregrine was the illigitimate son of the king of Sapodilla, which, as every schoolboy knows, was the last pagan kingdom in the world to resist Christianity. Cast out of Sapodilla as required by law when he reached his majority, Peregrine sallied forth into the Dark Ages with his page Dafty and the rather time-worn sorcerer Appledore to find his fortune. What he found instead was: dragons, whores, Huns, Roman legions, emperors, and a delightful collection of mysteries and adventures. The Avram Davidson Treasury — (1990) Publisher: Avram Davidson was erudite, cranky, Jewish, wildly creative, and sold most of his wonderful stories to obscure pulp magazines. Now his estate and his friends have brought together a definitive collection of his finest work, each story introduced by an SF luminary: writers like Ursula K. Le Guin, William Gibson, and dozens of others. The Other Nineteenth Century — (2001) With The Other Nineteenth Century, we offer a new collection focussing on Avram Davidsons distinctive historical fantasies, tales of strange Mitteleuropas, and of magic in Victorian England and on the American frontier. The Boss in the Wall — (1998) Publisher: Professor Vlad Smith is on a terrifying quest, one that will take him from the halls of our most hallowed institutions to the most run-down of old houses in blighted neighborhoods. A mysterious committee, shredded yellowed newspapers, a daguerrotype of a Confederate soldier, a headless corpse and a corpseless head… These are the clues which Smith must piece together to save his sanity and his daughter, and uncover the terrible secret of the Boss in the Wall. 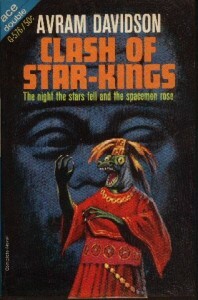 So, if I'm not going to read Clash of Star-Kings, at least I can help rename it with a title that better fits this cover.